Guatemalan President Otto Perez Molina and other government officials said repeatedly this week that they are considering legalizing and regulating opium poppy production in areas where it is already being grown illicitly. That's something of a surprise, but perhaps it shouldn't be. According to a Guatemalan press report, the proposal is one of a group of reform recommendations made by Amanda Fielding of the Beckley Foundation, the British drug reform and legalization group, which has had an office in the country since last year. Perez Molina has been talking a good game about alternatives to prohibition--and he just days ago stuck up for Uruguay in the wake of criticism of its marijuana legalization--but he has yet to actually do anything dramatic. This could be it. I'll write more about this interesting development during the daylight hours. In the meantime, a Spanish-language article from Prensa Libre is available here. And there's an English-language article from Newsroom Panama available here. They are considering legalizing opium poppy growing for pharmaceutical production, unless the laws regarding prescribing to addicts are liberalized how is this going to help with the world's heroin problem? At most we will just see a balloon effect with more opium growing in other areas. 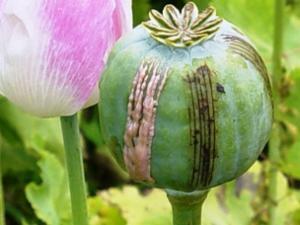 Do the farmer's make as much money growing medicinal opium? The Newsroom Panama article quotes opium poppy prices at $152 million for 127 hectares. Given that 127 hectares is about a half a square mile that seems like a massive overestimate, at that rate farmers would be multimillionaires (and really $17 million for 2.4 hectares of cannabis? Where do these people get these numbers?). Medicinal morphine is cheap, if medicinal opium is worth less won't farmers just divert to the black market? There is a worldwide shortage of medicinal morphine going on right now. So this isn't a bad idea, i just fail to see how this is in any way an answer to larger problem of illicit opiate production and use. It would be nice to find updated pricing, but this is the best I can do. Former UN Drug Czar Costa wrote, "$120-150 per kilo in Afghanistan vs. $12-35 per kg of lanced opium used for morphine production in India," in a speech titled "How the EU Can Help Contain the World Drug Problem." With the price of heroin at $5000 a kilo in Pakistan,the price is $5 a gram or 50 cents a point.This is for pure heroin.It takes 10 kilos of opium to make one kilo of heroin.The drug has to be smuggled into Pakistan at great risk.I'm sure the price in Afghanistan is much less that the price in Pakistan.A recent documentary had addicts paying 20 cents a point on the streets of Kabul.The production of opium has increased 40times since 2007..If opium was once again legal,addicts who were unlucky enough to get addicted could support a habit on social assistance.Of course the GOP would be outraged and refuse to pay for their drugs.In all of our history,prohibition counts for only 100 years.The other 10,000 we were just fine without it. I can't see that any drug, not even tobacco, booze, nor opium having even 1/100 of 1% of the negative consequences that their prohibition produces. The war on drugs is a man made monstrosity; insane, evil, racist, and utterly senseless. Those who have and still support it deserve jail time. They sure don't mind dispensing it. While medical marijuana is legal in California, it is still illegal on the federal level, so (as I'm sure you have heard) the DEA can, will, and has shut down multiple dispenseries. Legalization of marijuana are rampant nowadays and is making noise on every country. Now its opium? wow. What else is there to be legalized?